West Africa: Word, Symbol, Song will trace a millennium of the region’s history, from the great empires of the Middle Ages, through to colonialism and independence, and right up to today’s leading writers and artists, such as Africa’s first winner of the Nobel Prize for literature, Wole Soyinka. By looking at topics such as protest and religion, the Library will showcase the incredible creativity that has come from the region and celebrate how West Africans have harnessed the power of words and influenced culture today. On display in the exhibition, which opens in October, will be an impressive array of West Africa’s literary history, from early illuminated Qur’ans and manuscripts to recent graphic novels. Playing alongside beautiful objects, books, artwork and textiles will be fascinating historic and contemporary recordings. Starring a centuries-old drum language, recordings of Nigerian musician Fela Kuti and a modern performance of Sunjata, the medieval epic narrative, the exhibition reveals how West Africa’s literature has thrived and travelled through generations of oral history, as well as writing and symbolic systems going back many to the Middle Ages and before. The Library is pleased to reveal a brand new costume by Ray Mahabir, Artistic Director of South London’s Sunshine International Arts, which will star in the exhibition. The Bele (Bel Air) costume, based on a drum-dance and song developed in the Caribbean, relates the cross-cultural and transatlantic story of carnival. The Library has also commissioned a rare instrument to be made in The Gambia by a London-based Gambian musician. 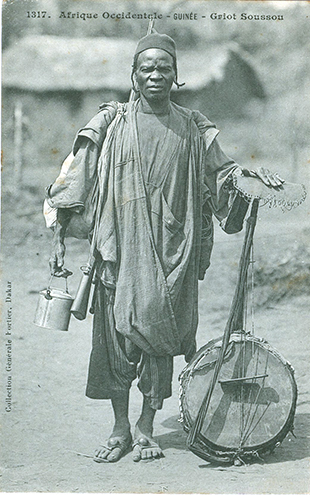 The instrument is called the akonting and is thought to be the ancestor of the better-known banjo from North America.